Who can resist a Peter Lorre musical? His dancing is half a beat behind his cohorts; his vocal dubbing is atrocious; and he actually falls with a splat behind the action in his first number—but try and take your eyes off him. This bulbous, bug-eyed creature who was an obvious model for Chas Addams’ family patriarch, Gomez, had a long career creeping audiences out in many film classics. As one of three Soviet commissars running loose in Paris, Lorre’s casting is a stroke of brilliance, and he might well have stolen the movie, were it not for that certain something called Fred Astaire & Cyd Charisse. At the ripe age of 57, Astaire was making this his swan song to film musicals, hopeful for one more major splash. On Bway, Silk Stockings wasn’t a big dance show; the leads only sang. But Arthur Freed saw greater potential in telling the story thru dance, and together with Astaire they transformed a decent stage musical into a better filmed one. 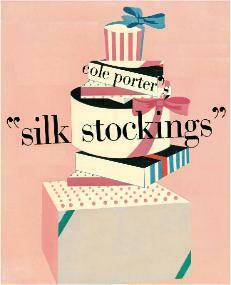 Silk Stockings was one of the first Bway musicals ever adapted from the movies—a practice still very rare in 1954. But the 15 year old film, Ninotchka, was catnip to Bway producers Feuer & Martin, who knew a Cole Porter show when they saw one. Whatsmore there was relevance to be mined in updating the story to a post-Stalinist, Cold War Russia. In many ways it’s a contemporaneous show, with spoofs of Hlwd and its then-current obsession with largess; mindless celebrity culture; pop songs from classical music; the cha-cha; even an early nod to rock ‘n’ roll. Taken from Billy Wilder’s screenplay (co-written with Charles Brackett & Walter Reisch) SS was adapted for the stage by no less than George S. Kaufman and polished by Abe Burrows. Yet the musical was very near disaster in its out of town tryout. But SS is one of those rare shows that defies all doubts and miraculously pulls together at the very last minute; the surprise smash hit. MGM had first refusal to movie rights, and Arthur Freed grabbed it for his first film as an independent producer. (The studios were all dropping their long term contracts in favor of freelance hires for individual pictures.) But as an indie, Freed felt free to flex his muscle by hiring Rouben Mamoulian (who was persona non grata at MGM since making Summer Holiday, an over-budget flop in 1948), to direct—and making the issue an ultimatum. The studio relented, and happily Mamoulian redeemed himself so well, the bean-counters later declared it the most efficiently produced musical in the studio’s history. Ninotchka is a Greta Garbo classic, one of her greatest roles, so how do you fill those shoes? Feuer & Martin picked a German actress Hildegarde Knef (not to be confused—as she often is—with cabaret chanteuse Hildegarde) and Anglicized her name to Neff--nobody heard of her much before, or after. For the film, with Astaire on board from the start, casting his Ninotchka narrowed the requirement to a suitable dancing partner. 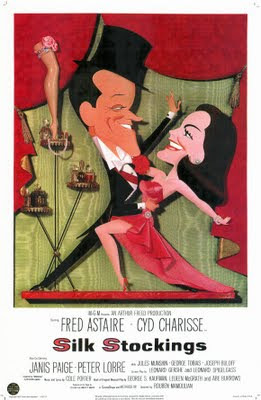 Cyd Charisse proved a great match with Fred in Minnelli’s Bandwagon, and this was a perfect excuse for a reunion. A tentative, unexpressive actress, Charisse rarely seemed to shine unless she danced—but here those qualities suit the character even if they don’t quite fill in the margins. Her accent is studied and inconsistent, her manner cool and brusque, but she warms up in dance. She would later say it was her favorite role. Likely a better actress would have illuminated the character, but I can’t think who else was right for it at the time. Surely no one could have danced the part better. The melody in this bridge section is so driven and exciting—you can hear a direct influence on Sondheim for “Lucy & Jessie” in Follies. But Paige, unlike Charisse, has good comic moments in her non-musical scenes; blue furs and dim-witted swipes at Tolstoy. She’s always looking for a drink; always foiled by Astaire—unfortunately it’s a gag that has no payoff; we never know what she’d be like if she had that drink, or why Astaire has to stop her. And after “Josephine” is halted, she’s gone from the picture entirely, tho Boroff still pines for her from Russia. Too bad she doesn’t seduce Lorre instead—now that would be a hilarious match. Paige would continue with occasional supporting film roles, but she was seldom given her due. I hadn’t realized how much her robotic blanket response: “There’s absolutely no truth to the rumors, we’re just good friends” had permeated my consciousness. I’ve been quoting it all my life. But a man to a woman, is her life. The irony here, being the supposed triumph of Western values over Communist ideals, such as sexual equality. It’s an unfortunate—and demeaning—song; and a musically dull one, too. For her final number, Charisse, back in Russia, leads a whirling dervish of an ensemble thru the paces of “The Red Blues,” a tune that has less to do with the blues than a Dixieland Jazz band. Her utilitarian Soviet garb, in shades of brown & gray may not make for a glamorous wardrobe, but her skirt here is of such aerodynamic construction; setting off perfect ruffles as she spins. It’s also a swell number, poking fun sideways at the communist idea of living space: the ensemble are her “neighbors,” groups of citizens living in “rooms” of curtained partitions. Drapes drawn aside, the neighborhood becomes one large assembly. Taking the joke further, the song stops abruptly, not once, but twice—the group assuming the pretense of a Party meeting while a presumed government spy passes thru. Ah, Russia. The film dares to make jokes about the Soviets; “It’s different here (Paris), they don’t rent rooms in pieces.” Astaire asks how much they would pay in taxes for $50,000 in Russia? The answer, of course: $50,000. They consult Who’s Still Who for references. Asked if she’s a music lover, the unthawed Ninothcka allows, “Music is essential for parades.” Maybe these jokes are corny—I don’t know. Perhaps because I’m Russian, and have had my fill of the Russian character, I find them all hilarious. “Too Bad (We Can’t Go Back to Moscow)” might seem like a throwaway opening number, but I’ve found it merits repeated viewings to enjoy the many layers within it. First off there’s Lorre, who barely attempts to lipsynch along, and winds up approximating Russian squat kicks hanging off two chairs. At one point he plops gracelessly to the floor—an accident, I’m sure, that Mamoulian decided to leave in. Front & center, of course are Astaire and the three French beauties he’s invited to help seduce the Ruskie commissars. The gals are indeed quite an eyeful, and dressed every bit as glamorous as the Russians aren’t. Once the song slips into a cha-cha, Astaire gives each a twirl before finishing up with Barrie Chase. She’s the one in gold lame and toothy smile, and her moves with Fred are even hotter than any of his with Charisse. She would prove to be his final recurring partner, appearing in several TV specials Astaire made in the next few years (It was a rather soft retirement). For the most part the great age difference between Fred and his latter co-stars was a non-issue, with Astaire himself perhaps the most uncomfortable. But Barrie Chase brought reality to the fiction of the May-December coupling, and he continued to pull out the dancing shoes with her for another decade. At which point he’s recruited by Francis Coppola. Contextually, Astaire’s final number makes no sense at all. He’s a film producer, what’s he doing performing a night club number? And just how does this relate to his winning back Ninotchka? It doesn’t. But symbolically—leaving behind logic—it’s cleverly calculated. Astaire asked Porter to write him a “rock ‘n’ roll” number in a nod to changing times, but also to show a bit of youth still left in the old hoofer. Always true to his fashion, Porter wrote a “Ritz Rock ‘n’ Roll,” which gave Fred license to re-don his top hat & tails, bring on a line of like-dressed men, and a quartet of mink-flapping women, and let ‘em rip. It’s an eye-popping finale, which ends with Astaire slapping shut his top hat—a symbolic end to his career. That business taken care of, we now return to our story already in progress….before the final fadeout. The film opened at Radio City on July 18, 1957. It has always seemed odd to me that cultural histories of this period inevitably cite the movie musical as already dying out. This may be true in the matter of quantity—studio production was down considerably from the previous decades. But paradoxically, as the pickin’s got slimmer the quality and prestige swelled—as well as the box office. Musicals were now regularly among the top earners of the year. More and more these were filmed Bway hits. The Music Hall certainly seemed to hunger for tuners. In ’57 alone they ran Funny Face, Silk Stockings, The Pajama Game and Les Girls—half of the year’s bookings. But Hlwd chose this single year to eliminate the category of “scoring for a musical picture,” (which deprived sure nominations for all the above) before restoring the field in a less competitive or exciting 1958. I first saw Silk Stockings on New Years Eve, forty years ago. It came on TV early in the evening, in B&W and pan & scan, which accounts for some dissatisfaction I felt at the time. But there was something also quite compelling to me: the Motherland factor. This wasn’t the back-country Jewish peasant Russia of Fiddler on the Roof which we’d all seen on stage by then. No this was the McCarthy-era, Khruschev-dynasty Russia that was in the genes of my parents--tho they had told me virtually nothing about their past even then. But I’d been around Russian émigrés most of my life, had spoken the tongue before English, and had their blood pulsing thru my veins. I knew these people well; how dreadful and oppressive they could be. Making fun of Russians seemed like good sport to me. Curious too, for a film set in Paris, there’s scarcely a Frenchman in it. 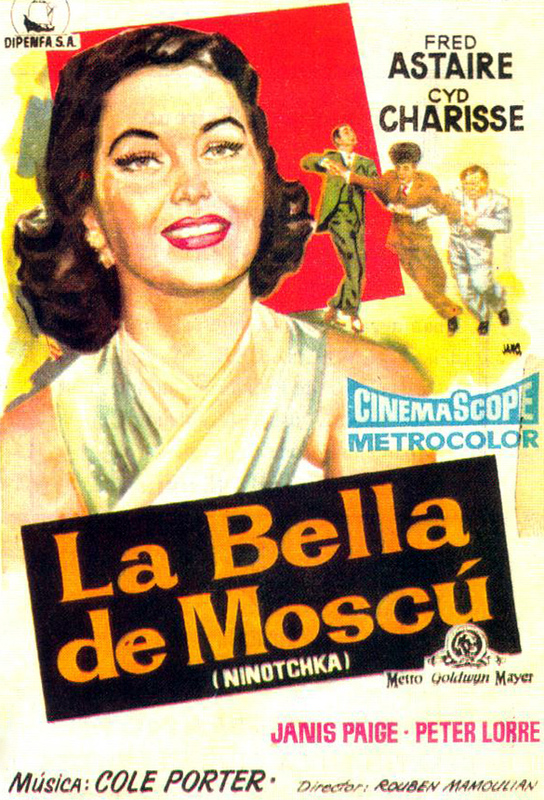 And of course the “Russian” in the music is as American as Cole Porter, which only meant that I could relate to it even more, having long before split from my genetic disposition to the Russian character to embrace my own religion: American musical comedy. In Silk Stockings I was tingled by both sides of the coin. So perhaps I have a stronger bias toward the achievement of this show. Even so, I think SS suffers an unfair & underrated reputation, which stems in great part from comparison to Astaire’s previous, and recent picture, Funny Face. Both were set in contemporary Paris; one scored by Gershwin (from his catalog); one by Porter (bespoke to the material). FF has Audrey Hepburn and Kay Thompson, but a wafer-thin plot and some added second-rate Roger Edens tunes, along with too much travelogue and fashion segments. SS, on the other hand has enuf story without such filler—here’s actually one movie set in Paris that hasn’t a single shot of the Eiffel Tower, or any songs extolling it. But maybe that’s what people really want, for Funny Face has over the years been anointed “classic” status among the two. Yet despite its charms I find it less satisfying. For me FF is a mere soufflé, and SS a plate of blini and caviar—and need I tell you which dish I prefer? Over the years I’ve actually seen a few productions of the show on stage—a quite delightful rendition at Equity Library Theater in NY; another that unwisely incorporated “The Ritz Rock ‘n’ Roll”; even more senseless with the stage script. It’s a perfect candidate for a full-orchestra Encores production—a great Porter score that needs rediscovery.